A leafy plant with stems in clumps has a skunk-like scent from the sticky, glandular hairs that cover leaves and stems; funnel-shaped, blue-violet flowers bloom in loose heads atop stem. Sky Pilot, or Sticky Jacob’s-ladder, has both grass-like and fern-like leaves, occuring in bright-green, 3-6 in. high tufts. The fern-like leaves are divided into thick segments with whorls of small leaflets. A 4-20 in. flower stalk arises from the leaf tuft and bears a cluster of light blue, or occasionally white, tubular flowers. Attractive stamens with golden-orange anthers project from the throat. Sky Pilot has both skunky and sweet-smelling flowers. The name Sky Pilot comes from its preferred high elevation habitat. Elizabeth Croston Buckalew: Aren't they! Elizabeth Croston Buckalew: Thank you very much! Its a lovely colour, nice shots Ell'. Elizabeth Croston Buckalew: I think so, too! Thank you, Frank! How delightful, Elizabeth. It sure would be glorious to suddenly come upon these! Elizabeth Croston Buckalew: Thanks so much, Ginnie! It really was wonderful - first you gaze out over the HUGE landscape.... then your eyes catch a riot of color at your feet... and these tiny little flowers just scream "hello"! What a beautiful image of a beautiful flower! It looks rather like a bell than a sky pilot. Elizabeth Croston Buckalew: Thank you so much, Philine! They are often mistaken for Harebell's! Elizabeth Croston Buckalew: Isn't it a lovely, Claudine! Thank you! Oh, this os so beautiful. I love the name Sky Pilot. Elizabeth Croston Buckalew: Thanks so much, Alan! I do, too! Wonderful flowers, Elizabeth. Very colourful and with a nice name. Elizabeth Croston Buckalew: They are! I just love these little tundra flowers! Elizabeth Croston Buckalew: Indeed, we are, Lisl! I love this color, too! 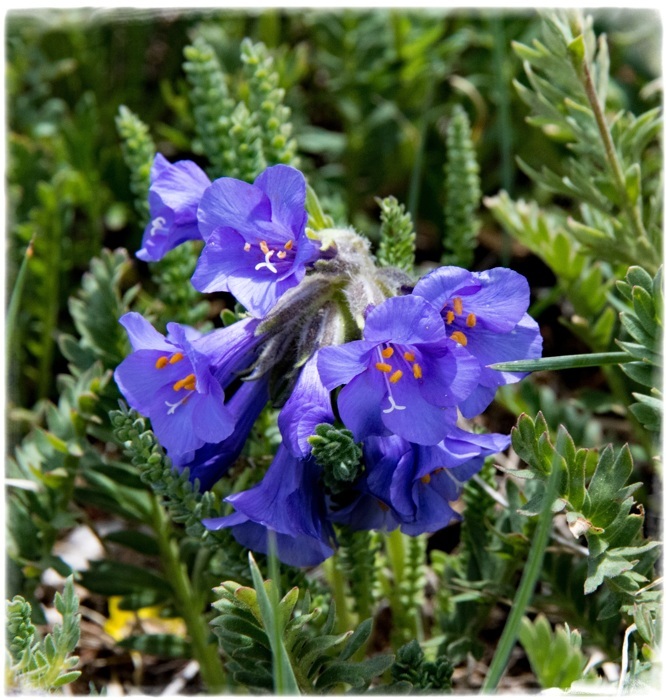 Elizabeth Croston Buckalew: Perhaps not - It's certainly a gorgeous plant, often mistaken for Harebell's or Bluebell's. Elizabeth Croston Buckalew: Thank you very much, Chad! A pretty plant, here the name Sky Pilot was used as a derogatory term for a Vicar in the Church. Elizabeth Croston Buckalew: It certainly is! That is an intense blue. Some great pictures. Elizabeth Croston Buckalew: Isn't it just gorgeous! The foliage is very interesting too. Elizabeth Croston Buckalew: Thank you, Mary - I sure think so! I like all four of thes eimages but especially I like the first one and its composition. Elizabeth Croston Buckalew: Thanks so much, Brian - I wasn't sure which I should post as the primary image - but I'm glad I chose that one! Elizabeth Croston Buckalew: Isn't it an amazing color! It may smell like a skunk, Elizabeth, but its colour and shape is just gorgeous. Elizabeth Croston Buckalew: Yes - I'll let it off the hook for that!